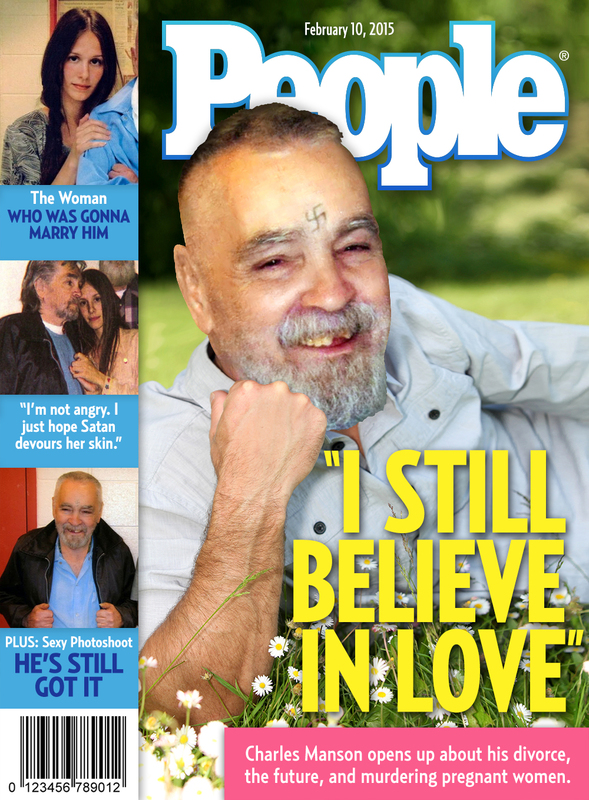 Given that someone decided it would be ‘funny’ to pretend to be Charles Manson in a series of juvenile emails containing death metal lyrics somewhere along the line in Bill Whites case, I’d thought I’d dedicate a Valentine’s Day post to taking the piss out of failed serial killer Charles Manson. Should there actually be any Charles Manson fans out there reading this, I’d just like to assure you that the sum of my caring for your hurt feelings is non-existent. But wait – failed? Yes failed, he achieved absolutely nothing – he was crap as a cult guru, crap at starting race wars, and crap at being a serial killer too (using ‘followers’ = too cowardly to do his own dirty work). In his entire life Charles Manson achieved nothing but crap, and being crap at everything is the only thing he was actually good at. But lately Charles Manson seems to have had a terrible turn in his love life. For a while all was good – he had a girlfriend buying him prison toiletries and was looking forward to be being happily, and creepily, married. But in a shocking turn, it was revealed that this much younger woman, Star, just wanted him for his body. Quite literally, his body. Charles Manson has garnered a number of headlines over the past few years over news that he was set to wed a woman 54 years younger than him. Now, there’s news that the nuptials were called off by the cult leader because he heard that his fiancee was planning to get rights to his body she she could put it on display after he died. And so unfolds the terrible tragi-comedy of Charles Mansons’ marriage. Perhaps he should have realised that he’s unlikely to attract anyone sane…for obvious reasons. Should anyone disagree with my perspective, please express your opinion clearly by quoting death metal lyrics in an offensive email that will cut my non-existent feelings to the core. Of course if there are thousands of people visiting this website literally desperate for someone to ‘follow’, the bad news is that there is no one but me here so your choices are extraordinarily limited. I’m not a ‘gang’ leader or member either so expect disappointment if you are looking for a ‘gang leader’ to ‘follow’. On our associate Harold Covington’s blog, Harold has kindly composed another piece on Bill White’s imaginary ‘following’. That is not to say Bill imagined this; on the contrary this diabolical diatribe is the conjuration and deliberate fabrication of the penal system to limit his communication. Unfortunately they seem to believe that there is some coordinated smattering of Neo-Nazi’s somewhere out there who double as crazed Charles Manson fans. Blatantly absurd and ridiculous – there are next to no Neo-Nazi’s anywhere. All there are is small pockets of people coordinated by a few individuals who would be hard pressed to organise a meeting in a cafe, let alone managing anything significant. The entirety of the Right Wing is so fragmented as to be impotent, and not a threat to anyone. For each dozen ‘followers’ there is a ‘leader’ – all of whom have different ideas and different goals. These remarkably astute ‘leaders’ also spend more time attacking each other online than anyone else and rendering everything utterly futile. There is no real ‘following’, anywhere at all – here, there or elsewhere. Even less here than elsewhere. Everyone has moved onto more successful and lucrative ideas, which most certainly do not entail a light ‘following’ of ‘neo-nazi gangs’. As I stated before, I have no ties or interest in performing necromancy on dead political movements from the days of yore. Fascism perished with it’s founders and will never rise again. Such things are dead and gone, and Bill White has no ‘followers’ – if he did, he might not be in such a mess…! And there we were thinking Bill was having bad luck with all the solitary confinement and lack of communication. It seems to be standard procedure/torture for everyone. As we know from past ‘issues’, the United States of America takes Facebook *very seriously*. More seriously than reality in fact considering murderers seem to get shorter sentences than the people talking crap on Facebook.